Etiological Agent: Rhabdovirus carpio (RVC). The disease was known as “Infectious dropsy of carps”. 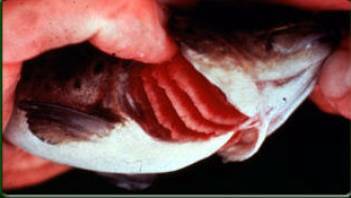 Clinical signs: Gathering of fish at water outflows, dark colouration, lower respiratory rate, hemorrhages especially over the skin and gills, loss of balance, exophthalmia, inflamed vent, etc. Internally they show hemorrhages in the viscera, air bladder, etc. Frequently there is secondary invasion of the tissues by aeromonads and pseudomonads from the intestine resulting in the bacterial septicaemia. Vectors: Blood sucking parasites Piscicola geoimetra and Argulus foliaceus. Treatment: There is no method of eliminating the virus from the infected fish. Etiological Agent: A new serotype of rhabdovirus similar to spring viremia of carp virus (SVCV) and Rhabdovirus carpio (RVC). Clinical signs: Ventral hemorrhagic inflammation, bleeding in the scale bases, necrotic fins, inflammation of the alimentary canal, serious liquid deposition in the abdominal cavity, swollen spleen, pale liver, opacity of the inner wall of the swim bladder with hemorrhages, etc. Treatment: Control methods for viral diseases are restricted as there is no chemotherapeutic measures available at present. Application of antibiotics helps only in prevention of secondary infections. Although a number of pathogenic bacteria have been isolated from diseased fishes cultured in ponds, the following are worth mentioning. Etiological Agent: The causative agent is a bacterium Flexibacter columnaris. Clinical signs: An external infection with lesions appearing on the body surface and gills. Whitish ulcerations, erosion of the gill lamellae and hemorrhages may also be observed. Treatment: Environmental improvements, especially increased oxygenation, control of organic addition, etc., are the most valuable supportive therapy. Practical control of outbreaks of columnaris is possible with a number of drugs, including copper sulphate (0.5–1.0 ppm) and potassium permanganate (2–3 ppm) in pond treatment. Various other treatments are also employed including dip treatment for 1–2 minutes in 1:2000 copper sulphate colution. If the fish are able to feed, incorporation of oxytetracycline in the feed at the rate of 8 g/100 kg of fish/day for 10 days is also effective. Etiological Agent: Aeromonas hydrophila and Pseudomonas fluorescens in carp and other species. Treatment: Pond treatment with potassium permanganate (2–3 ppm) followed by addition of oxytetracycline with feeds at the rate of 70–80 mg/kg fish/day for 10 days are the most effective and practical measures. Acriflavin was found very effective for such purposes when used at the rate of 3–10 ppm. Etiological Agent: The causative agent is the Aeromonas salmonicida complex. Clinical signs: Skin inflammation is followed by exophthalmia, oedema of all organs and finally anaemia. Treatment: For the control and treatment of CE, chemotherapeutics are applied as bath, intraperitoneal injection or with food. 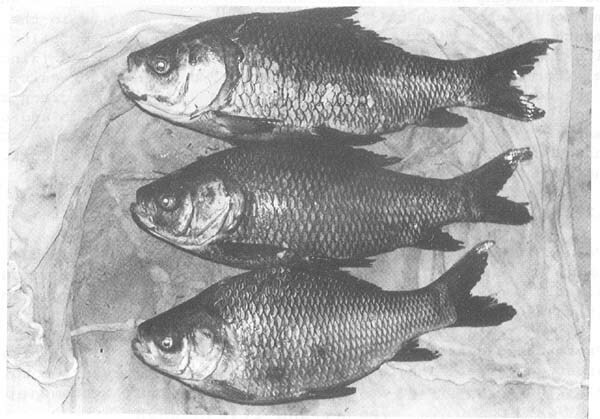 Oxytetracycline at the rate of 7.0–8.0 g/100 kg of fish/day for 8–10 days, oxytetracycline or chloramphenicol or furazolidone in baths (80–200 g/m3) or oxytetracycline or chloramphenicol as intraperitoneal injections at the rate of 10–30 mg/kg have been found to be very effective. Treatment: Short baths for 5–10 minutes in 3% common salt solution has been found to be more effective than treatment with antibiotics. Two subsequent treatments after an interval of one week completely cures the disease. Saproleqnia sp., Branchiomyces sp. and Achlya sp. are usually implicated in fungal infections, but they are considered to be secondary invaders following physical or physiological injury brought about by rough handling or attack by primary pathogens. Branchiomyces sp. is another filamentous fungus, which obstructs the blood vessels in the gill filaments causing discolouration and finally dropping off altogether leaving the cartilaginous support exposed. Malachite green (zinc free grade), formalin, potassium permanganate, copper sulphate, salt, etc., are the common therapeutics for effective use. Malachite green at the rate of 0.1 ppm for pond treatment, 1% solution as a swab and 65-ppm concentration as short bath/dip for 30 seconds are used. Copper sulphate may be used for pond treatment at the rate of 0.5 to 1.0 ppm depending on total alkalinity. Parasitic diseases are usually encountered more frequently than microbial diseases. The following are some disease causing parasites and their symptoms in Asiatic carps. Ichthyophthirius Pin-head size white spots on the skin, fins and gills. Presence of ciliated trophozoites with relatively large horseshoe shaped nucleus. Trichodina Presence of saucer-shaped actively moving ciliate parasites on body surface and gills. Myxozoans Presence of cysts, spores on gills, body surface and/or in the squash preparations of kidney. spleen, air-bladder, etc. Argulus Haemorrhagic spots, lesions over the body and presence of parasites attached to fish body by means of suckers and hooks. Gyrodactylus / Dactyloqyrus Presence of parasites in gills and skin. Diseases known to be occurring due to nutritional deficiencies and environmental disorders are of little importance. Proper monitoring and management of pond ecosystem and provision of adequate quality of supplementary feed will avoid occurrence of such diseases which sometimes appear in ill-managed ponds. Liver lipoid disease (LLD) in catla and gas bubble disease in early fry of rohu are worth mentioning. Therapy can be applied in two ways: external treatments or treatment via diet. External treatments: There are two methods of application of external treatments. The most common method of administering therapeutic agents to fish is immersion in water soluble compounds. These are baths in lower concentration of chemicals ranging from short to prolonged periods and dips where the fish are dipped into a chemical solution of high concentration for a very short period ranging from a few seconds to 5 minutes. Swabbing is application of drugs in high concentration when dealing with individual fish with localized external infections. 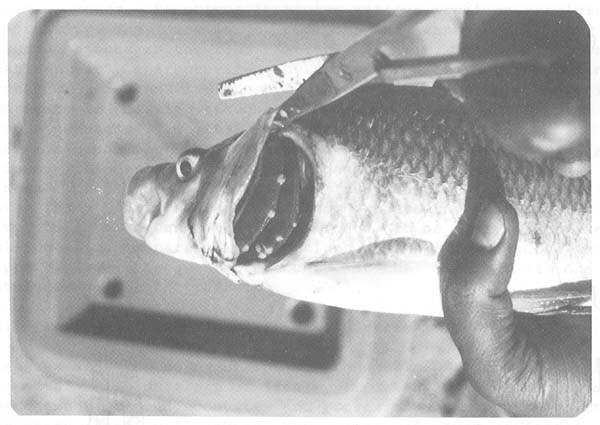 For better convenience it is desirable to immobilize the big-sized fish prior to swab application. Treatment via diet: This method is usually applied for treating the systemic bacterial diseases or gut parasites by incorporation of the drug into the feed. Loss of appetite is one of the first signs of a disease and hence in such cases the use of drugs in proper doses through supplementary feeding becomes difficult. Leeching of drug is another problem. If some of the water-soluble drugs are properly mixed with vegetable oil prior to its final mixing with the feed, such losses may be minimised. Generally, feeding medicated feed is considered to be a prophylactic rather than a therapeutic measure.